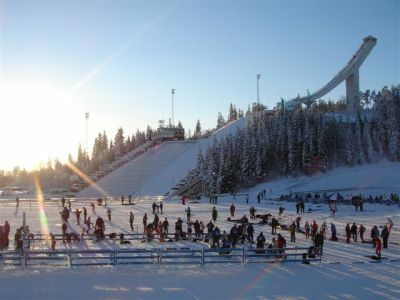 The Holmenkollen Ski Jump is a place we often go to with visitors; besides a spectacular view over Oslo and the Oslo fjord, it is quite special to see a real Ski Jump from so close by. Willem-Jan and Patricia (my brother and his girlfriend) were the true lucky ones; this weekend was to be even more special since the Ski Jumping competition took place at Holmenkollen! Truly amazing to actually see people jumping from the Ski Jump, eh? We still had a nice time, sightseeing and watching the finish of the Nordic Combined cross-country…as for jumping; better luck next year!